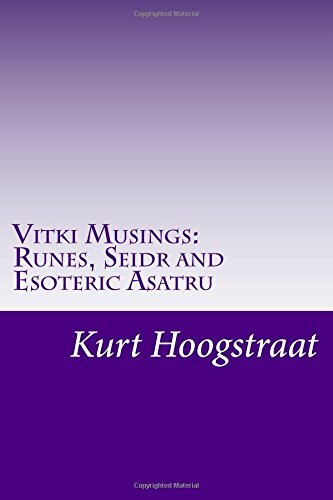 Like sitting down with a friend for a cup of coffee or glass of mead, "Vitki Musings: Runes, Seidr and Esoteric Asatru" is a glimpse into the life and mind of a Vitki/Norse Shaman. Based on the popular blog, Vitki Musings is more than merely cut and paste. You will find new commentaries and new musings which offer an enhanced reading experience in regards to all manner of esoteric Asatru. Filled with tips, hints, and exercises for the novice and veteran Vitki alike. Find out what readers worldwide already know - Vitki Musings is the real deal! Kurt Hoogstraat is a 50-something Vitki, living in the suburbs of Chicago. He is an ordained gothi and a certified core shaman of the Norse path.